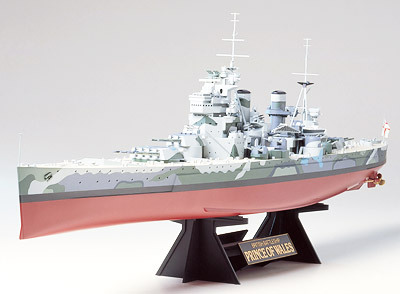 TAMIYA 78011 HMS PRINCE OF WALES BATTLE SHIP (1/350)! This 1/350 scale series offers an excellent way to experience the magnificent grandeur of these famous warships. In addition to their accurate proportions, these models also offer realistic details such as bridge areas and deck surfaces, as well as precision made parts such as masts and ant-aircraft weapons.